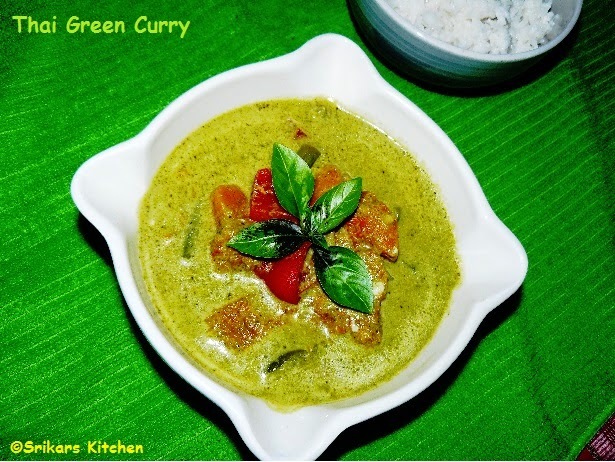 Green Curry is Thai variety of Curry.The name "Green "curry means from the color of the dish which is comes from green chillies and herbs.This curry is Coconut milk.based typically eaten with Thai sticky Rice or Rice Noodles or Indian flat bread. Make a paste for all green paste ingredients above & keep it aside. Heat oil in a pan, add ground green paste & saute.Add all vegetables ,water,salt & allow to boil. Add coconut milk & allow to simmer. Add 1 tbsp palm sugar & mix well.Serve with hot rice or Roti.